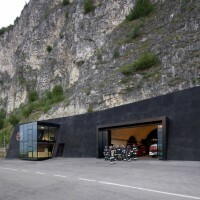 bergmeisterwolf architekten designed a fire station in a cave in Margreid, Italy. 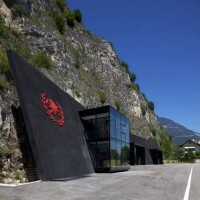 A rock face is the location of the new volunteer fire brigade of margreid on the wine street. Three big caverns are drilled into the rock and interlinked with a cross cut. 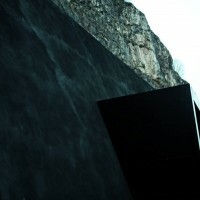 A black pigmented concrete wall stands in front of the rock, with the same inclination as the mountain. 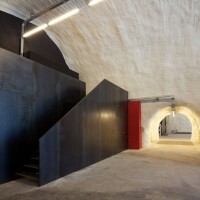 The three caverns dock on to this concrete wall. The wall is the main architectural element of the fire brigade and at the same time a protection against down falling stones. 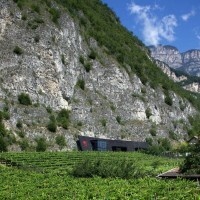 Therefore resulted a sensitive handling with the topography and the requirements of use. 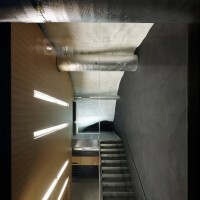 we chose concrete as the material for the wall: durable, strong and powerful; the dark colour is achieved by the application of beech coal dust and should bear resemblance to burned wood. Three corpuses penetrate this wall. 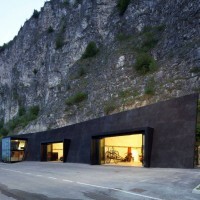 two garages break through forming portals which are covered with black coated steel. These garages are closed with glass folding gates which allows the red fire engines to be seen from the outside. In the area of the office and administration wing the wall is breaked through by a cantilevered pending glass cube which gives free sight in all directions and brings light into the inside. 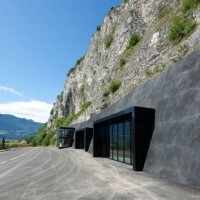 The interior of the caverns is characterized by simple materials: wood, glass and steel are used subtly and contrast the cavern with its harsh plastered surface. 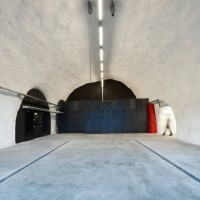 In terms of sustainability the fire brigade differentiates itself in two points from other projects: the positioning of the building and the overall energy concept. 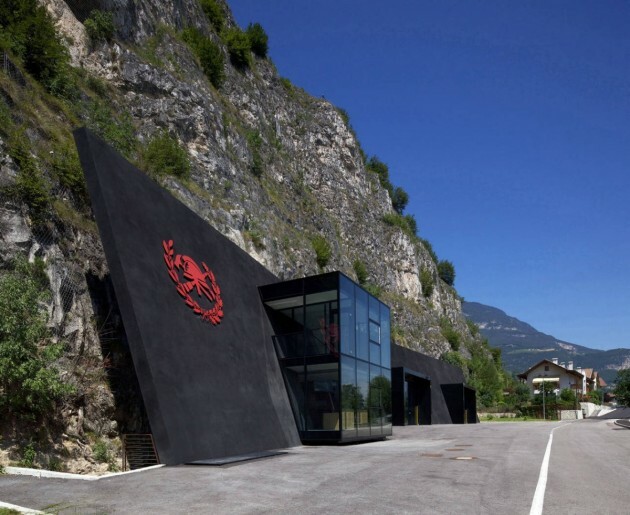 The building could have been placed on a normal lot as most of the houses, but because of the rare grounds in the alpine context the community decided to build the fire station into the rock. Therefore valuable ground has been saved and can be used for agriculture. This means an active contribution to save resources. in order to reduce running costs and contribute to environment protection the community of margreid wanted to build an energy efficient building. This also encouraged to the decision to place the building into the rock where only the glass entrances face the outside (-10°c in winter). 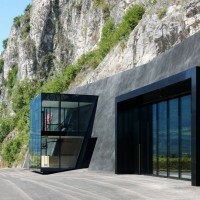 The rest of the building lays inside the rock (+12°c in winter). As a result heating costs were reduced and therefore energy is saved. In addition, a dynamic simulation of the heat flow allowed to select the parts of rock which had to be insulated. 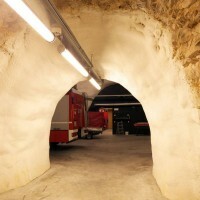 Consequently only the administration of the station had to be covered with thermal insulation while the garages could be heated with the natural temperature of the surrounding rock. 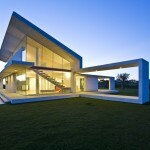 The remaining glass surfaces are carried out in triple heat absorbing glass. The residual energy for heating and hot water is covered with an ecological pellets heater system. 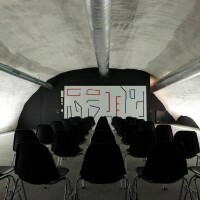 Visit the bergmeisterwolf architekten website – here.